Blissfully beautiful folk that will have you harmonising with your hips swaying. 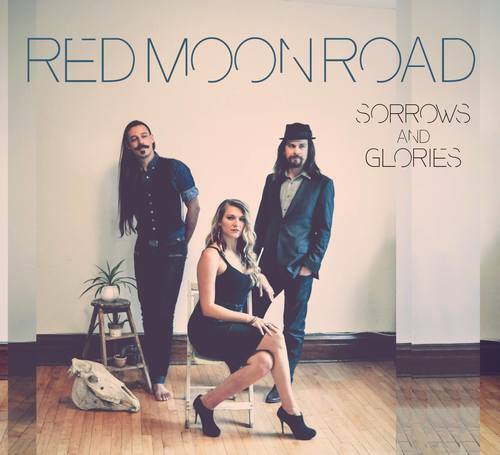 Aptly titled Sorrows and Glories, Red Moon Road return with their third studio album, which was recorded in the aftermath of an accident which saw lead singer Sheena Rattai need to take time out of a life on the road to recover from an accident. The record itself covers the healing period as well as many of the highs the band have experienced in their ever-growing career. Essentially a folk trio that centre their sound on a harmony drive, the real star on Sorrows and Glories is the crisp, clear and emotionally rich vocal of Rattai at the albums centre. While the charming harmonies have echoes of Britain’s finest Americana trio Red Sky July, they appear to be less integral to the finished sound of Red Moon Road. While the trio do mix up vocal duties along the way, with both Daniel Péloquin-Hopfner and Daniel Jordan in fine voice, it is when they deliver gospel driven harmonies to Rattai’s vocal that the spine really tingles. At their most striking, The Lumineers’ flavoured I’ll Bend But I Won’t Break and the powerfully spiritual a capella opener Beauty In Their Broken Bones, Red Moon Band manage to take subject matter that is common to the genre but deliver them with an inspired edge that will etch them for all eternity in your memory. With an ability to make the everyday seem enticing, and a personal story that is truly moving thrown in to mix, Red Moon Road catapult their third studio album into the elite of their genre. This is a record that not just needs to be added in to your collection, but warrants the trio that created it to be awarded a flurry of awards.